Myth or magic: Can a teaspoon ward off onion tears? The food-related urban legends that granny used to throw about sneak into many a kitchen conversation. We decided to seek the truth behind the more plausible ones because, let’s face it, you definitely don’t grow rabbit ears from eating while lying down. Onions are renowned for possessing powers of persuasion over our tear ducts. So much so that a flurry of old wives tales were spawned as possible miracle cures. 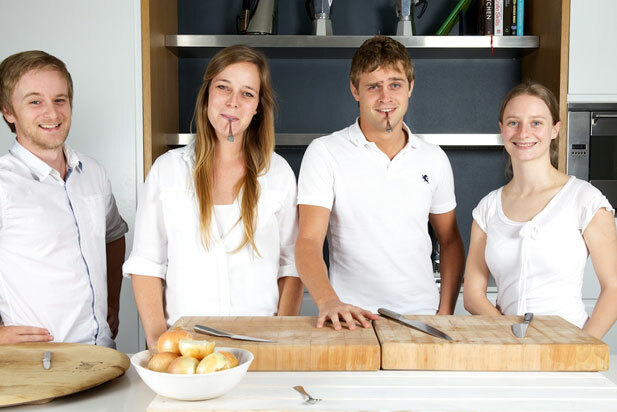 In a totally non-scientific environment, devoid of lab coats and formula scribbled chalkboards, with only test subjects and our own noses to collect the data, we decided to see whether a teaspoon can really ward off crocodile tears. To dispel any notions that only girls are affected by this woeful vegetable, we got Brad and Donnae to tackle the onion with teaspoon in the mouth and left Carryn and Tim in a spoon-less lurch to fend for themselves. We did need some consistency after all. All four contenders previously attested to bawling like babies when dicing this layered bulb. The theory behind this old wives tale is that the sulfurous enzymes released by cutting the onion, bind with the metals in the stainless steel spoon en route to your lachrymal glands (the ones responsible for reflexive tears). After much dicing and chopping of the onion, in rather questionable technique, neither Brad nor Donnae were able to shed a salty drop. 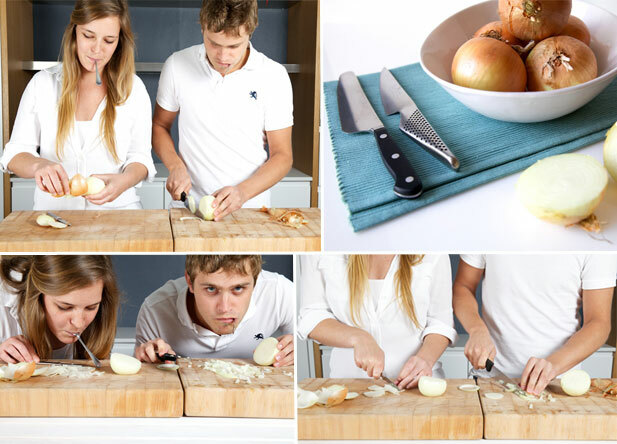 We even encouraged close-range onion slicing to no avail. Interesting. 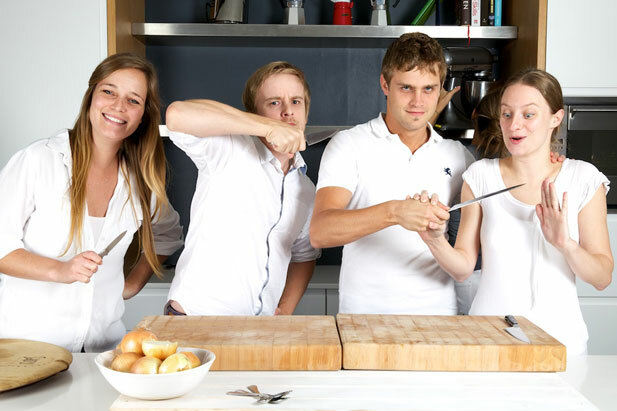 Carryn and Tim, our teaspoon free choppers, had mixed emotions towards their onions. Carryn’s own adrenaline at being in front of the camera seemed to ward off the sulfurous fumes rather efficiently. Tim on the other hand was a sight for sore eyes. So either the teaspoons were magic and Carryn’s just a soldier, or our little spoons were much of a muchness and Tim’s just a sensitive soul. Our honest conclusion? The teaspoon is just an obstacle to divert your attention from thinking about the waterworks and prevents you from inhaling through your mouth, which limits the amount of sulfurous enzymes from stimulating your nasal cavity and mucous membranes. So now you know. 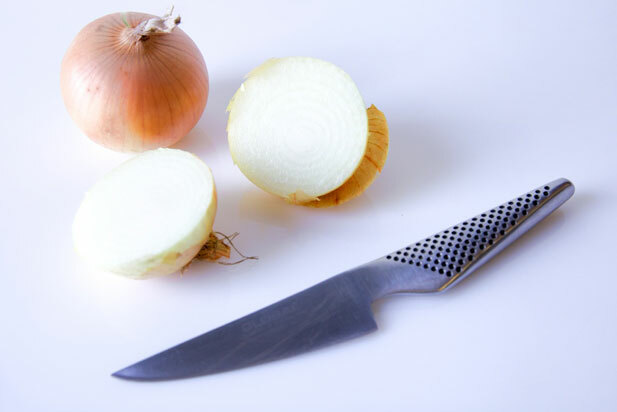 Learn how to cut an onion like the experts (apparently the sharper the knife the less damage to the fume exuding enzymes). Alternatively you could look out for the genetically modified sweet onions, grown in low sulfur soil. Although onions are renowned for their detoxing properties so perhaps it’s best to let nature do it’s thing and have a good, cleansing cry.